And the Arctic is the area where the warming is greatest. Therefore this regional summary looks at the area in some detail. The following figure shows average Arctic temperature from the available satellite data (red) in comparison with the Antarctic (blue) [adapted from http://climate4you.com/]. 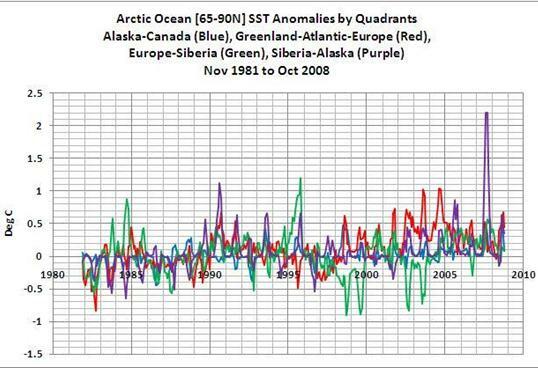 Arctic – warming; Antarctic – not. The figure below shows the Arctic region along with average minimum and maximum sea ice extent as well as the ice migration path (from http://www.amap.no/). 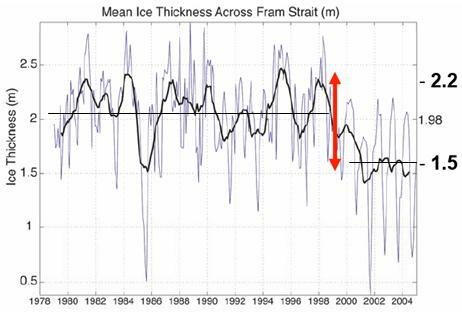 The Fram Strait is the exit taken by most of the ice that leaves the Arctic. The numbers indicate the normal number of years for ice at that location to exit the Arctic ocean. 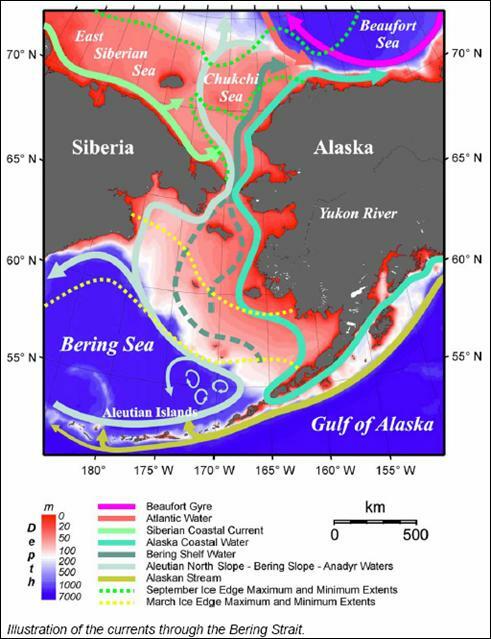 There are two main ocean water gateways of inflow to the Arctic – the Atlantic via Fram Strait and the Pacific via the Bering Strait. Normally the main inflow and outflow is via the Fram Strait with the Bering Strait being secondary. 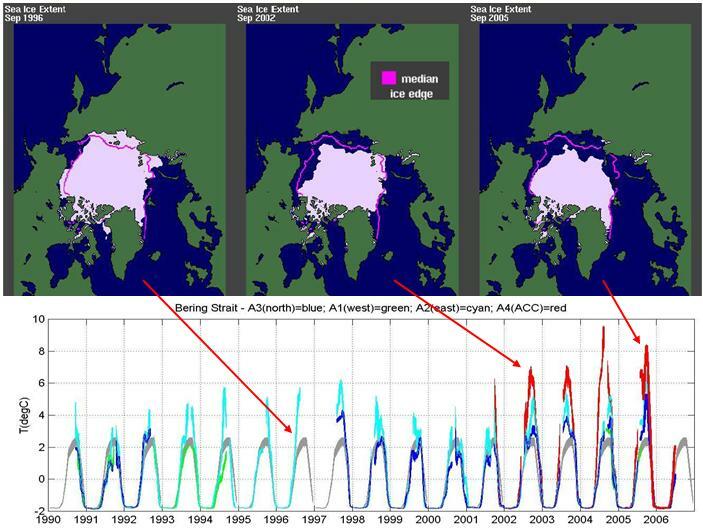 In recent years increased summer flows via the Bering Strait have had a major impact on Arctic sea ice. There are very few temperature stations in the Arctic. 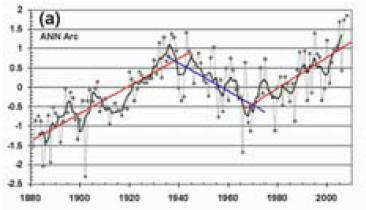 The following figures examine historical temperature data from two sources: the Hadley Climatic Research Unit (HadCRU) gridded data and the NOAA Global Historical Climate Network (GHCN) station data. 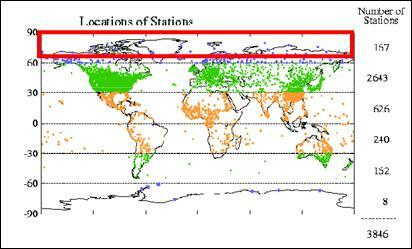 The NOAA GHCN database provides data for individual stations throughout the world. The HadCRU gridded data has adjusted station data and calculated averages for 5x5 degree grids. (See www.appinsys.com/GlobalWarming/GW_Part2_GlobalTempMeasure.htm for more details on these data sources). 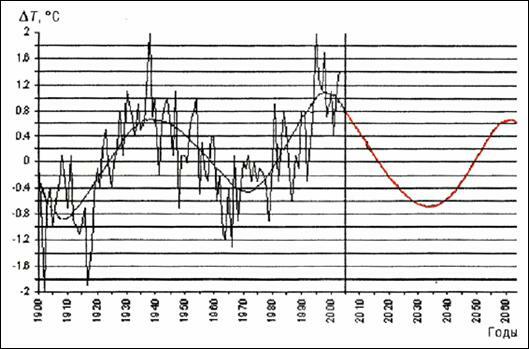 The following graphs show the data for 75 – 90 degrees N latitude (1930 – 2007). Left: average of all available HadCRU grids (14 grids), Right: average of all GHCN stations with data extending after 2000 (7 stations). 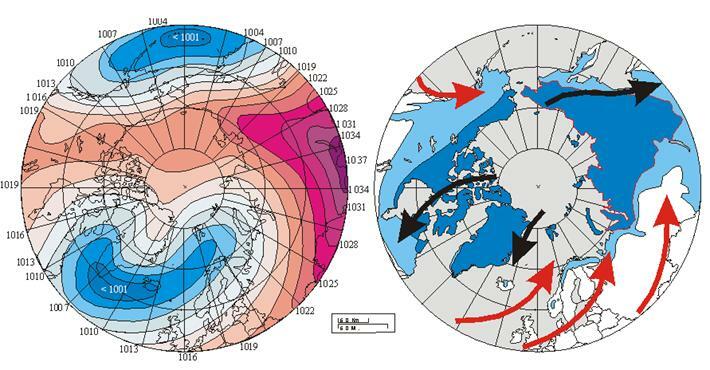 The two data sets are similar showing for the high Arctic that recent temperatures are becoming similar to the 1930s. 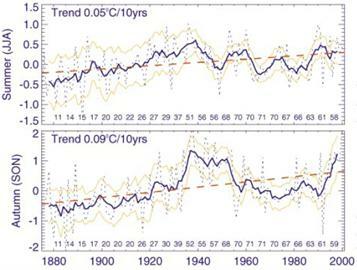 The following graphs show the data for 65 – 75 degrees N latitude (1930 – 2007). Left: average of all available HadCRU grids (58 grids), Right: average of all GHCN stations with data extending after 2000 (39 stations). Again the data sets are fairly similar, although temperatures in this latitude band have exceeded the 1930s in the last few years. 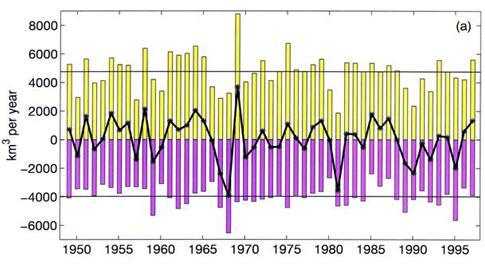 The following figure compares the Arctic temperature trends with global temperature trends. The Arctic temperatures are correlated with sea temperatures. 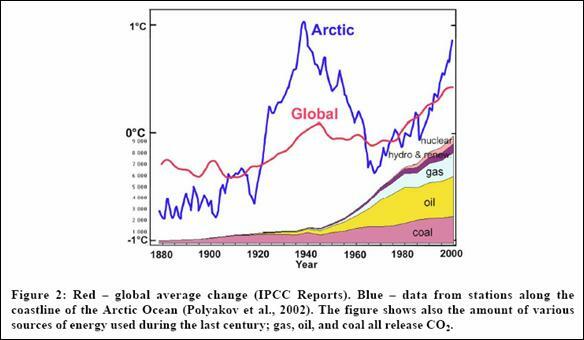 [http://www.frontier.iarc.uaf.edu/~igor/research/aw/index.php] Two observations are evident from this graph: the recent Arctic warming is not unprecedented and the long-term overall temperature increase started before the increase in anthropogenic CO2. 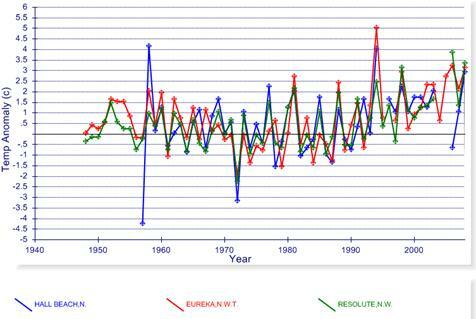 The following figure shows seasonal temperature trends for the Arctic (from “Variability and Trends of Air Temperature and Pressure in the Maritime Arctic, 1875 – 2000”, Polyakov et al, American Meteorological Society Journal of Climate, 2002 [http://www.frontier.iarc.uaf.edu:8080/~igor/research/warm/warm_apr02.pdf]). 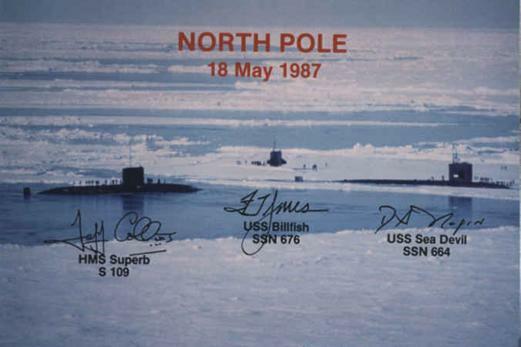 That paper stated: “We speculate that warming alone cannot explain the retreat of Arctic ice observed in the 1980s–90s. Also crucial to this rapid ice reduction was the low-frequency shift in the atmospheric pressure pattern from anticyclonic to cyclonic. Positive and negative LFO phases of the SAT are shifted by 5–15 yr relative to those in the SLP record. 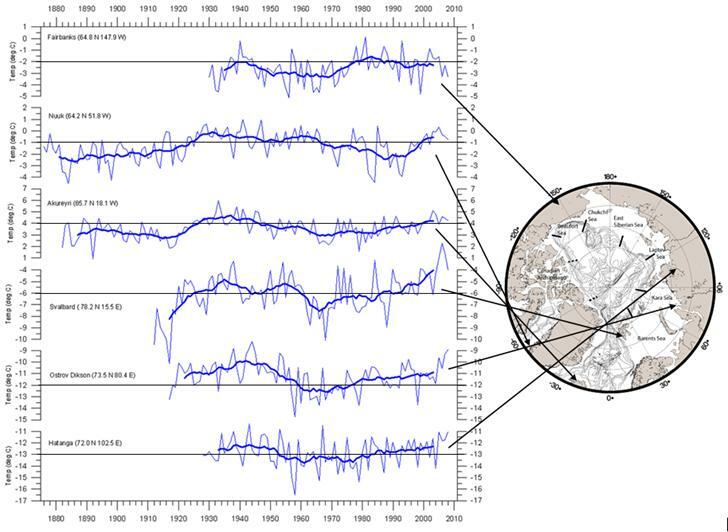 The complicated nature of Arctic temperature and pressure variations makes understanding of possible causes of the variability, and evaluation of the anthropogenic warming effect most difficult.” One thing that can be observed from the temperature data: the long-term warming trend started long before the major increase in anthropogenic CO2. The following figure shows available long-term Arctic temperatures from the GISS database [http://www.climate4you.com/Polar%20temperatures.htm]. 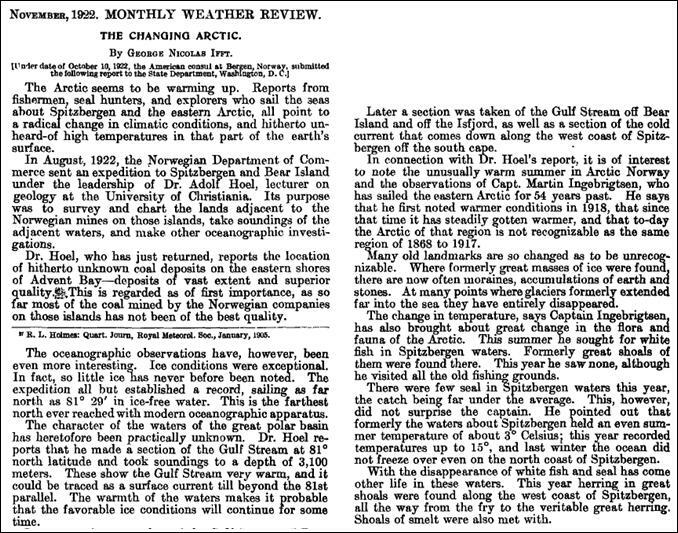 For most locations, when data are available back to the 1930s it is clear that the recent warming was not unprecedented. The following figure shows average temperature trends in various “polar bear regions” of the Arctic. Somehow the polar bears managed to survive the 1930s. A 2005 study of the effects of solar irradiance on Arctic temperatures (Soon, W.H., "Variable Solar Irradiance as a Plausible Agent for Multidecadal Variations in the Arctic-wide Surface Air Temperature Record of the Past 130 Years," Geophysical Research Letters, Vol. 32, 2005 [http://www.agu.org/pubs/crossref/2005/2005GL023429.shtml] showed that there is a much stronger correlation between temperatures and solar irradiance than with CO2, as shown in the following figures. An article published in 2007 (I.E.Frolov et al. Scientific Research in Arctic. Vol. 2. 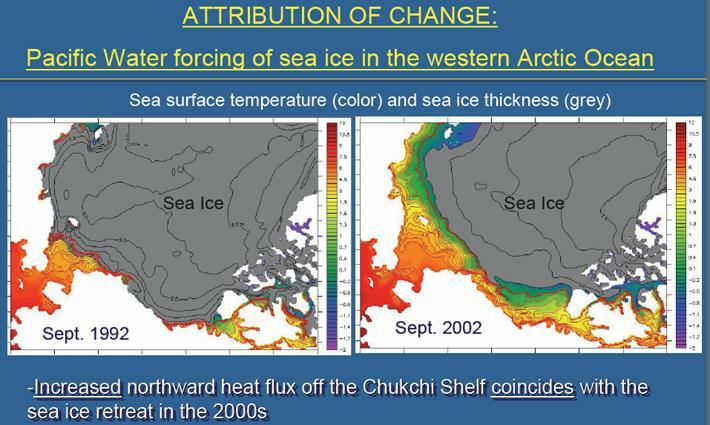 “Climatic changes in the ice cover of the Eurasian shelf seas”, 2007 Arctic and Antarctic Research Institute (AARI) – St. Petersburg, Russia [http://icecap.us/images/uploads/AARI_PREDICTS_ARCTIC_COOLING.pdf]), shows the following figure showing the annual mean surface air temperature for 70N-90N and its predicted trend. 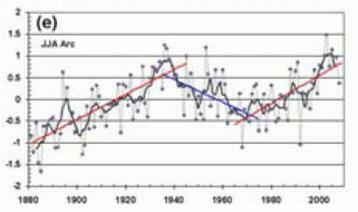 The following figure superimposes the Arctic average annual temperature shown above on the Atlantic Multidecadal Oscillation (AMO). 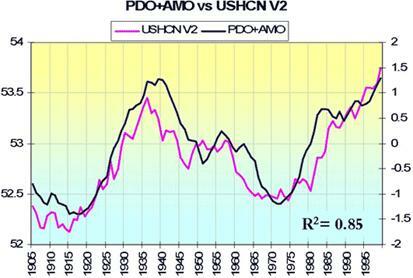 The following figure shows the sum of the AMO plus the Pacific Decadal Oscillation (PDO) [http://intellicast.com/Community/Content.aspx?a=127] (black line). 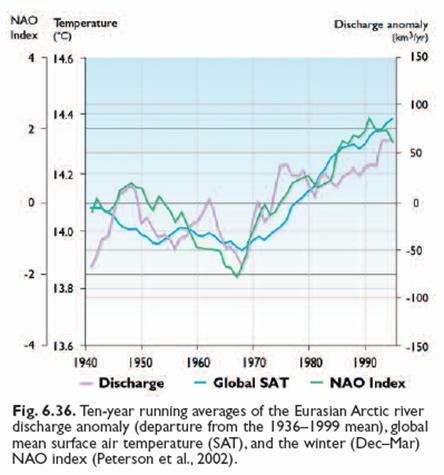 The following figure shows the AMO+PDO (black line above changed to red below) superimposed on the Arctic average annual temperature shown at the beginning of this document. 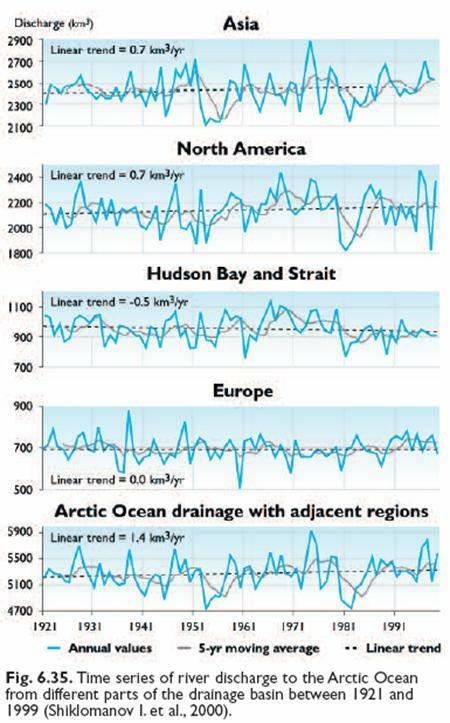 The above figures show the clear correlation of the Arctic temperature cycles to the oceanic oscillations – no CO2 connection. 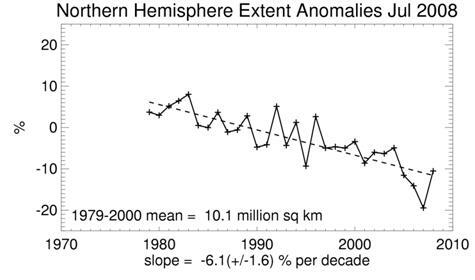 Arctic sea ice has indeed been declining in summer in recent decades as shown in the following figure showing annual July sea ice extent anomalies. The following figures are from the above paper. Top: Arctic annual ice volume change (summer ice export in magenta, winter ice growth in yellow, black line - annual rate of change. Bottom: arctic ice volume 1950 - 1997. As can be seen, the recent decrease in ice volumes is not unprecedented. 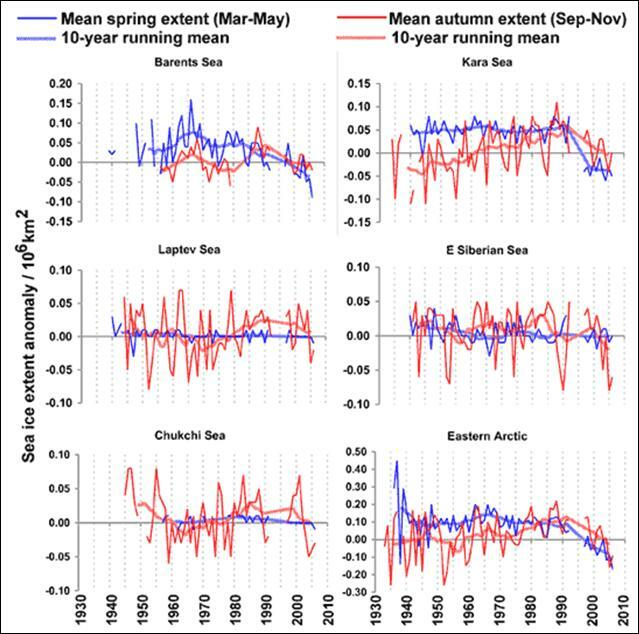 The following figure shows spring and fall sea ice extent for seas adjacent to Russia [http://nsidc.org/research/projects/Barry_Eurasian_Arctic.html]. 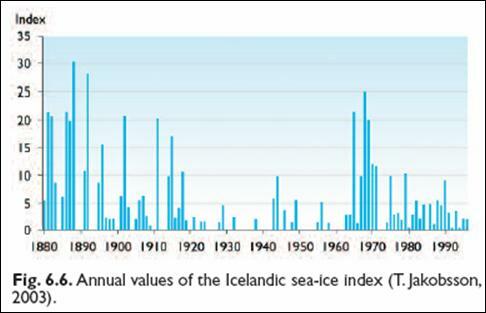 For many of the areas, recent sea ice decreases are not unprecedented when the historical data of the 1930s is included. 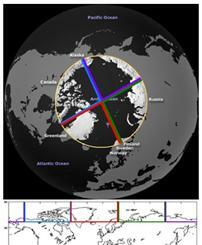 The University of Illinois Polar Research Group provides sea ice comparisons for any date [http://igloo.atmos.uiuc.edu/cgi-bin/test/print.sh]. The image below compares the nearest available date to the above 1987 photo with the same date in 2008. 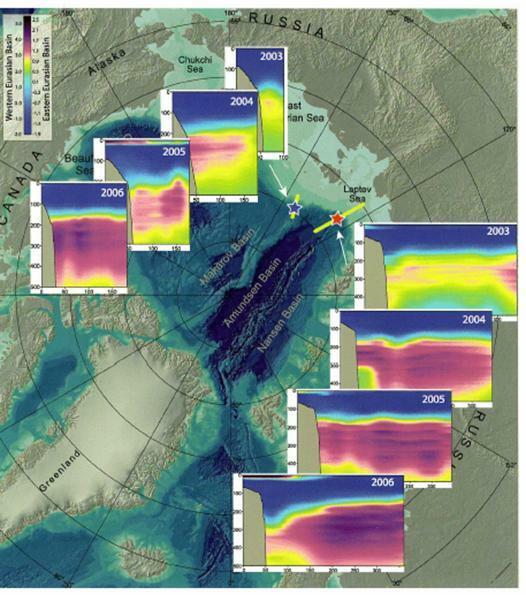 The following figure shows the mean ice thickness across Fram Strait [http://www.ees.hokudai.ac.jp/coe21/dc2008/DC/report/Maslowski.pdf]. 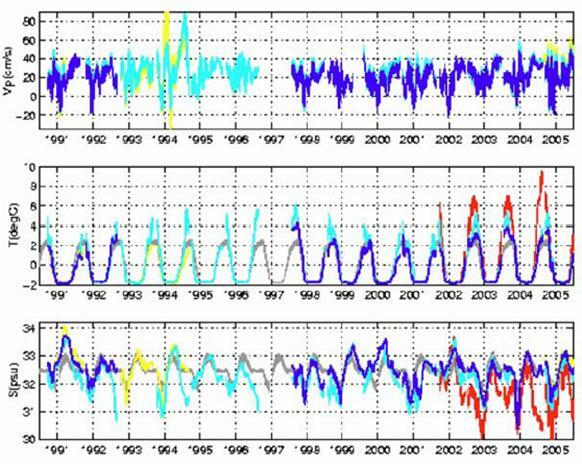 There are large annual fluctuations, which changed to a new level after the 1998 – 2000 decline. 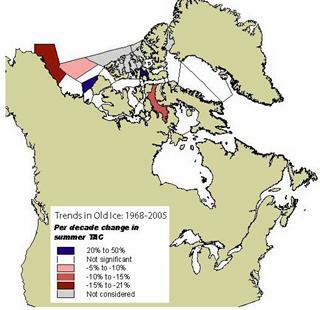 There is considerable variation in regional trends of Arctic sea ice reduction: [http://ice-glaces.ec.gc.ca/content_contenu/minArcticIce_2007.pdf] “Sea ice trend studies for the Canadian Arctic indicate that while some areas show significant negative trends, many areas do not yet display detectable trends.“ The following figures show summer ice trends in all ice (left) and old ice (right) for the Canadian Arctic. The following figures show: Top: the available temperature anomaly data for the 3 longest-term stations in the Canadian Archipelago region in the GHCN database. Data only exists since about 1950. All three stations have similar temperature trends. 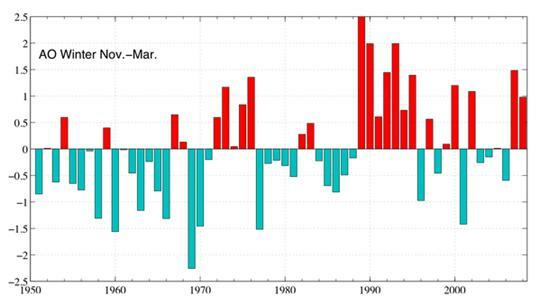 Right: monthly temperature data (blue) for one of the above stations (Eureka), as well as the annual average (red). 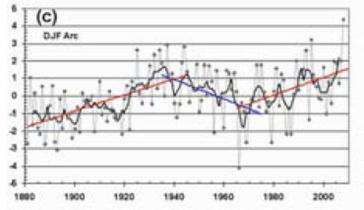 The monthly temperature data shows that the summer temperature has fluctuated an insignificant amount compared with the winter temperature over the last 60 years. 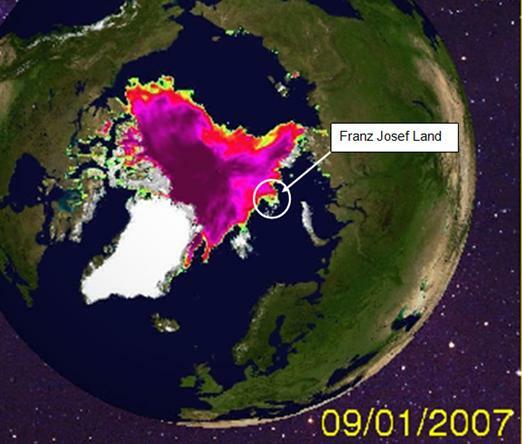 In 2007 the Arctic sea ice reached a record low. The National Geographic article cited previously states: “Scientists say the record loss last year was due to a combination of warm ocean currents, fluke winds, and unusually sunny weather.” – i.e. not due to CO2-induced air temperatures. “In parts of the Arctic Ocean this year , sea surface temperatures were 3.5°C warmer than average and a full 1.5°C warmer than previously recorded highs, says Michael Steele, also of the University of Washington in Seattle. All that warm water chewed away at Arctic ice from below. In some parts of the Beaufort Sea, north of Alaska and western Canada, ice that started the summer 3.3 m thick ended up measuring just 50 centimeters. 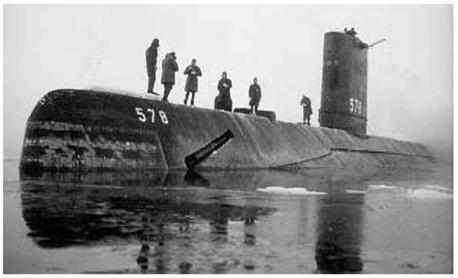 About 70 cm of that shrinkage resulted from melting of the ice's upper surface—a typical amount for the summer, says Perovich. However, a whopping 2 m or so of that erosion, about five times the normal summer loss, occurred from below”. The figure below shows the increases in seawater temperature at two locations in the Arctic Ocean in the area north of eastern Russia. The figure below shows anomalies for Arctic air temperature, freshwater content, ice thickness, intermediate Arctic Ocean temperatures and North Atlantic salinity. 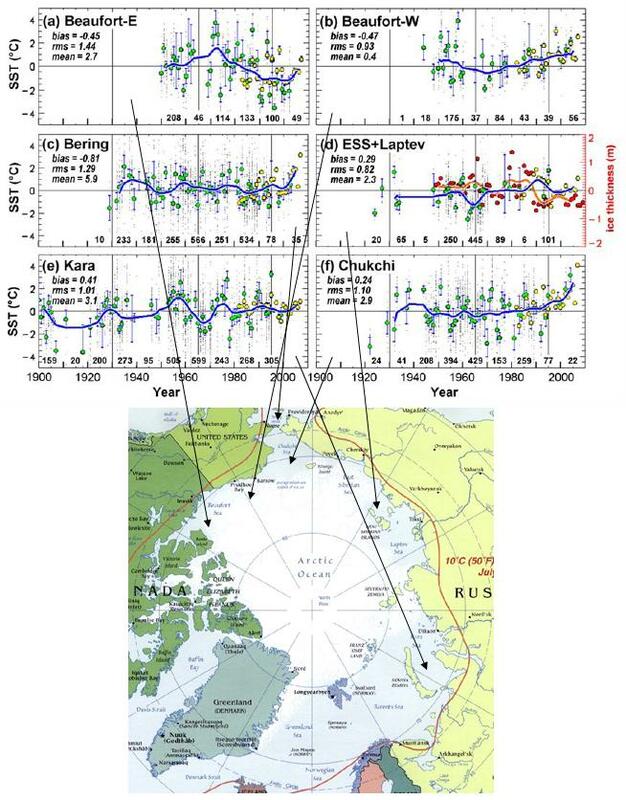 The following figure is from the same paper, showing velocity, temperature and salinity data for the Bering Strait from 1991 to 2005. 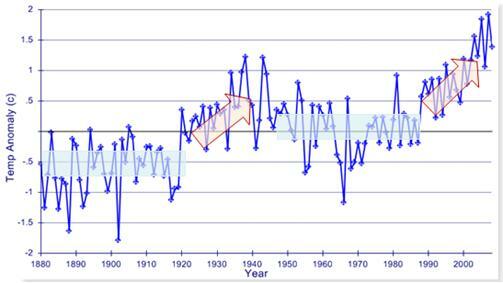 The velocity and temperature have been increasing and salinity decreasing in recent years. 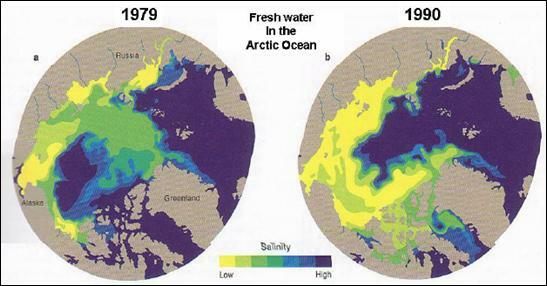 The following figure is from the same paper as above, showing decreasing salinity from 1979 to 1990 in the Arctic adjacent to the Bering Strait. 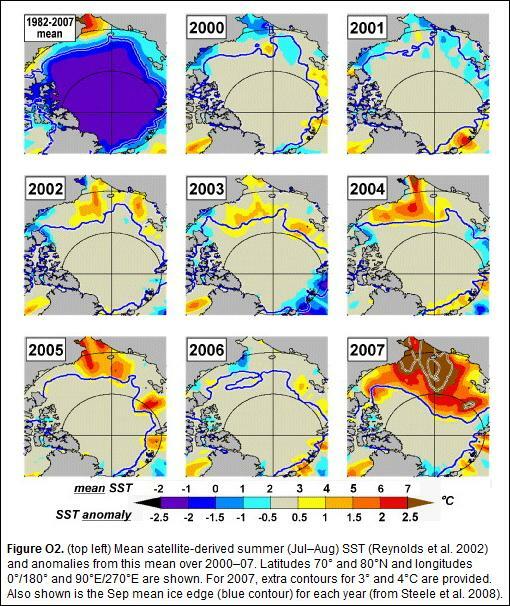 The following figure combines sea ice plots from [http://www.ametsoc.org/atmospolicy/documents/May032006_Dr.WieslawMaslowski.pdf] with a plot of Bering Strait temperature from [ www.udel.edu/CATS/reports/OSU2006/RebeccaWoodgateBering.ppt ] That report states in the conclusions: “The increased heat fluxes via Pacific/Atlantic Water explain the lack of correlation between sea ice and atmospheric forcing in the 2000s”. 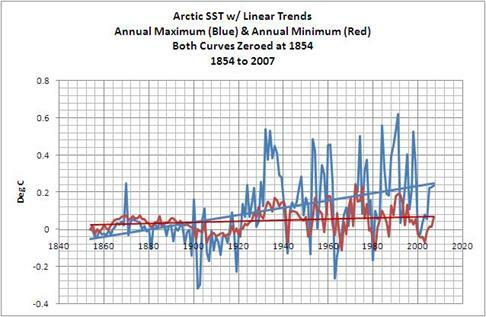 The following figure shows Arctic sea surface temperatures in terms of annual maximum temperature anomalies (blue) and annual minimum temperature anomalies (red) [http://bobtisdale.blogspot.com/2008/06/arctic-sst.html]. 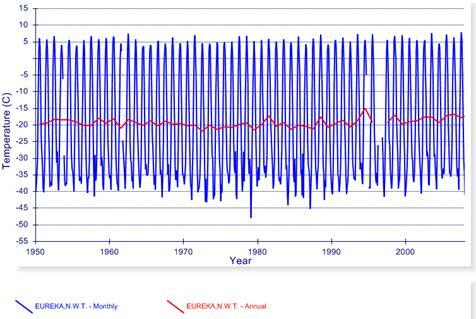 This shows the opposite trend from Eureka air temperatures (above) – summer ocean temperatures have increased and fluctuate significantly, while winter ocean temperatures have not increased significantly. The Gakkel Ridge is an underwater mountain chain extending 1,100 miles from the northern tip of Greenland to Siberia and is the northern extension of the Mid-Atlantic Ridge, which runs all the way down the middle of the Atlantic Ocean (see www.appinsys.com/GlobalWarming/RS_AntarcticPeninsula.htm to see where this ridge connects to Antarctica). These volcanic eruptions are deep below the ice and would not directly cause any melting of the Arctic sea ice. 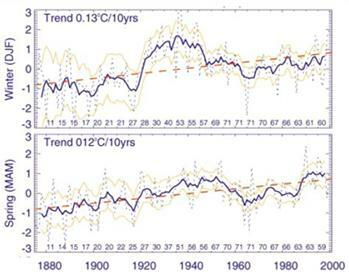 A study published in 2009 (Levitus et al: “Barents Sea multidecadal variability”, Geophysical Research Letters, Vol.36, 2009) provides the following figure showing “Monthly temperature (C) in the Barents Sea for the 100–150 m layer, from 1900 to 2006. Years without all 12 months of data are not plotted. 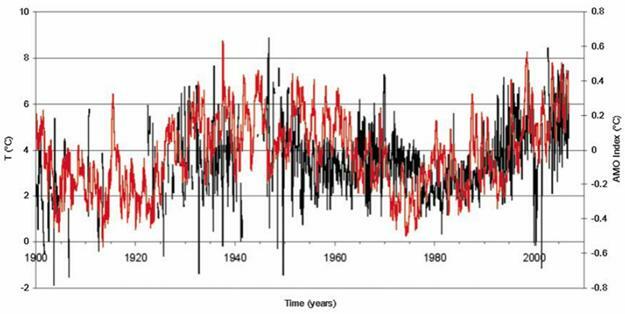 The red line is the Atlantic Multidecadal Oscillation Index” [http://www.leif.org/EOS/2009GL039847.pdf]. 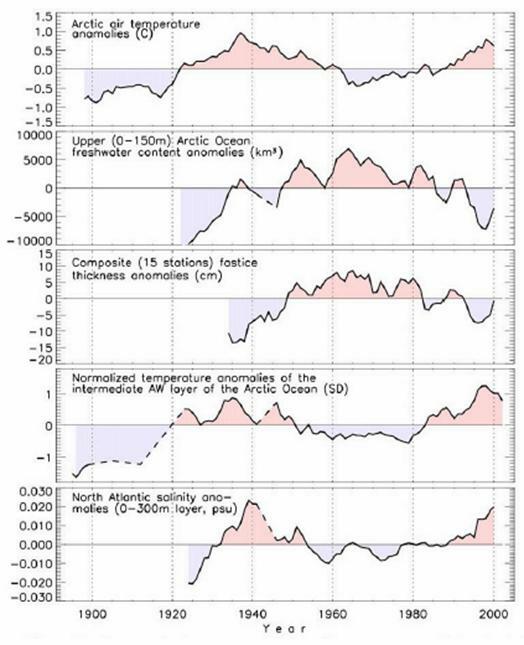 This shows a strong correspondence between Arctic – Barents Sea – sea temperatures and the AMO. 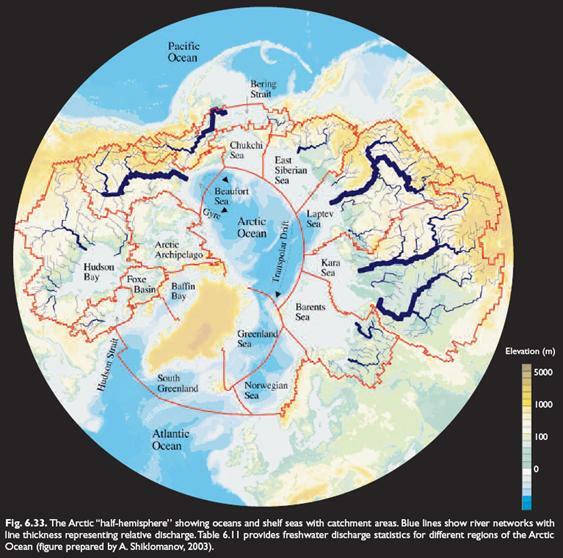 One of the reasons for increasing temperatures and increasing fresh water is the increased river discharge in to the Arctic Ocean. The following figure shows relative river inflow to the Arctic Ocean [http://www.acia.uaf.edu:16080/PDFs/ACIA_Science_Chapters_Final/ACIA_Ch06_Final.pdf]. 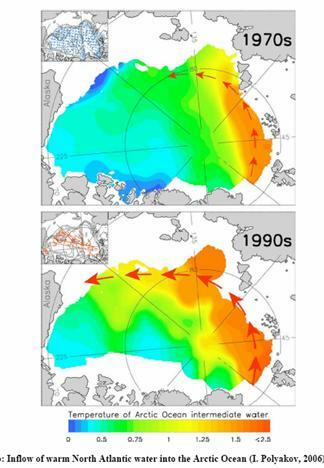 The following figure shows historic sea ice extent in the Nordic Seas (Vinje, T., 2001. 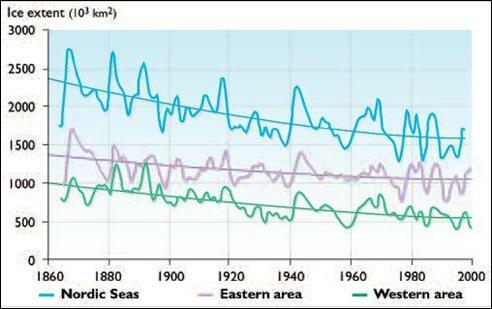 “Anomalies and trends of sea ice extent and atmospheric circulation in the Nordic Seas during the period 1864–1998”. 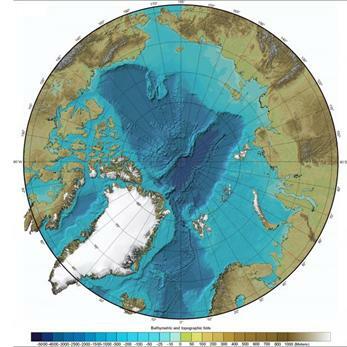 Journal of Climate, 14:255–267 [http://www.eoearth.org/article/Sea_ice_in_the_Arctic]). The general trend of decline in sea ice has a time frame much longer than anthropogenic CO2 – likely since the end of the little ice age. 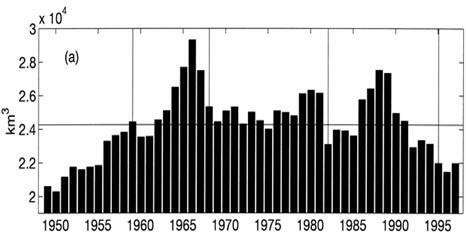 The following figure shows Icelandic sea ice since 1880 [http://www.acia.uaf.edu:16080/PDFs/ACIA_Science_Chapters_Final/ACIA_Ch06_Final.pdf]. 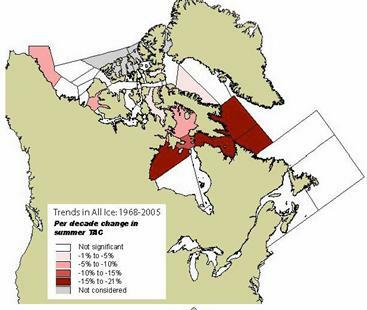 The current reduction in sea ice is not unprecedented – it was lower in the 1930s – 1940s. The long term trend has been a decline since the 1800s – i.e. since before CO2 could impact the climate. 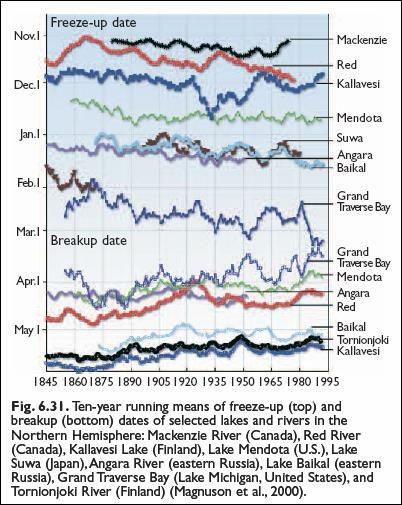 The following figure shows various rivers that flow into the Arctic Ocean in terms of their freeze-up and break-up dates since 1845 [http://www.acia.uaf.edu:16080/PDFs/ACIA_Science_Chapters_Final/ACIA_Ch06_Final.pdf]. The long term trend has been evident since the 1800s – i.e. since before CO2 could impact the climate.